Hospital Fire Protection | Morristown Automatic Sprinkler Co.
Morristown understands the complexities of hospital fire protection needs. Unsurprisingly, one of the most prevalent industries we service is the healthcare industry. Hospitals and other medical centers are often heavily populated with people and expensive equipment. For those reasons and more, it is essential for hospitals to have a reliable sprinkler system in place in case of fire. 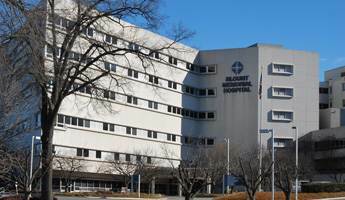 Morristown Sprinkler has years of experience installing dependable sprinkler systems for hospitals and other medical centers in East Tennessee. From traditional water sprinklers, to special hazard and clean agent suppression systems, we will make certain that your workforce, patients and expensive equipment are protected in the unfortunate event of a fire. Also, keep in mind that if you already have a sprinkler system in place, but are in need of an upgrade, we can install a more modern system for you. Similarly, if you have an older building devoid of a sprinkler system, we can perform our retrofitting service for you. Please let us know if you have any questions about our hospital fire protection services, or if you would like us to provide you with a quote for your facility.